This year, we decided to use our above ground garden to plant a lettuce crop to harvest into the winter. Lettuce tends to do well in our area because it thrives in temperatures from 45-65 degrees F. Our lettuce plants are doing beautifully, they are super easy, and it is so rewarding to be able to walk to the garden and pick a bowl of fresh greens for our dinner, a snack for the chickens/turkeys/guineas, or a big bowl to feed the bunnies! 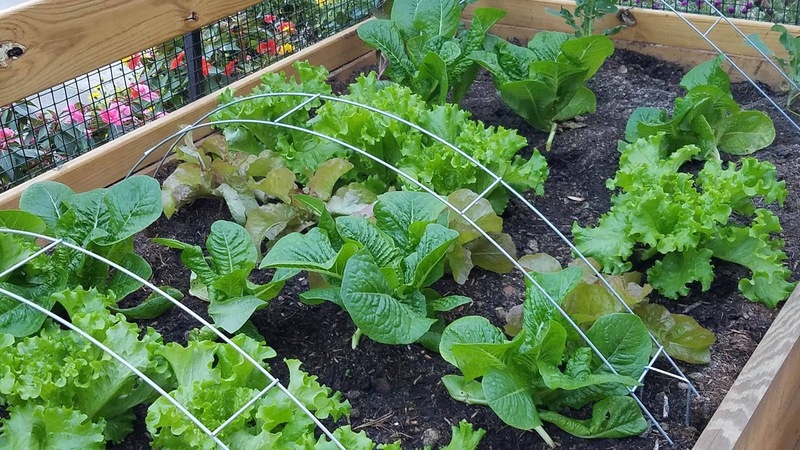 Lettuce also continues to grow after you have plucked a few leaves, making this an excellent winter crop that could extend to spring if you live in the regions that don’t suffer from extreme temperatures. Also, you don’t have to have a huge raised bed or in ground garden to grow lettuce. You can grow lettuce in a small pot on your porch, all it requires is good quality dirt (we recommend Good Dirt), light, water, and protection from extreme heat or cold. On a recent morning, the weatherman announced that the “growing season” technically ended in our area when the temperatures went down to 23 degrees. Apparently, he has never heard of something we decided to try a few weeks ago in hopes of extending the growing season of our lettuce garden for as long as possible. 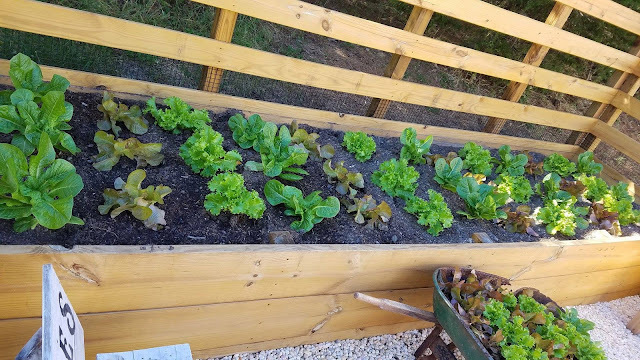 Using some new products that Gardener’s Supply Company sent to us, I am very happy to say that our lettuce not only survived the cold snap, but it did so beautifully, without one bit of damage! Garden super hoops were so easy to install, you simply bend them into spot with little effort, and stick them in the ground, securing them with garden staples. These row cover hoops do an excellent job of not allowing the moist cover fabric to lay on the tender plants, which keeps them from freezing. 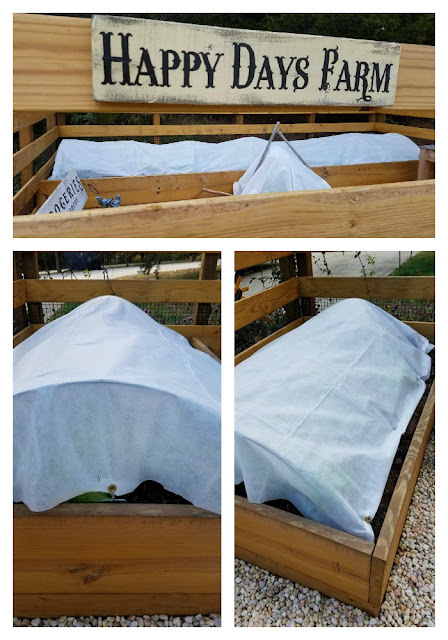 The frost quilt itself, which is sometimes called floating row covers, was rated for temperatures down to 24 degrees, which should protect our garden for much of our winter. It rarely gets much lower than that here. I am very pleased to say that when I went down to the garden that morning, a bit nervous, I must admit, my lettuce plants had survived! 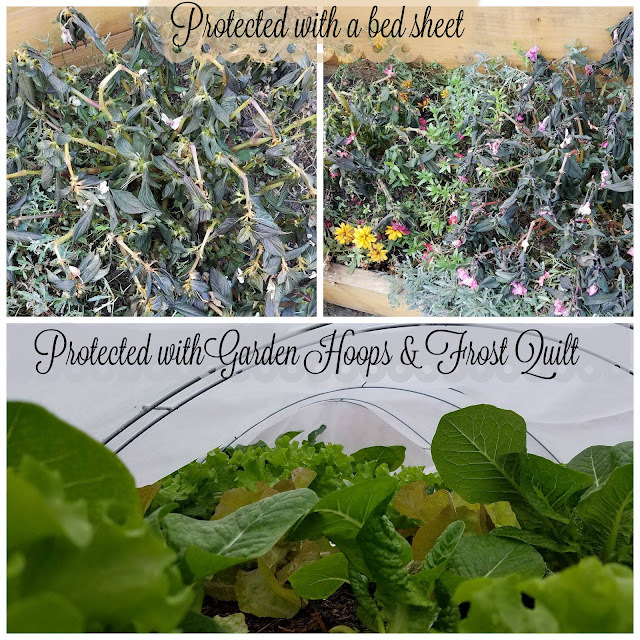 The garden quilt frost protector is made of polypropylene fibers that allows 60% of light to pass through. It was raining this morning, so I went to check on the plants, and I am pleased to report, that water was also passing through the material. What I love about this product is the fact that I don’t have to remove the sheeting each morning and recover the plants each night. The material is light enough that it will not suffocate the plants during the day. To show you the difference, I didn’t have enough of the material to cover the flowers around the front of the garden, so, I decided to use the old standby, which is an old sheet. Unfortunately, the sheet did nothing to protect the flowers. However, it did prove to me that these products worked great! Just to show you the difference, in the below photos, the top two images are of flowers in the same raised bed as my lettuce garden. I only covered this section with a bed sheet. (I ran out of the frost quilt) As you can see, the bed sheet did nothing to protect the plants, and by lunch, they had literally liquified. However, the section using the garden row super hoops and the frost protection fabric survived, and is doing wonderfully, even though our temperatures dropped so far.